Greek scholar, Hebrew poet, and preacher; born March 27, 1411. A manuscript preserved in the Vatican (No. 305) contains several works of his, namely: a poem composed in 1453 on the occasion of the capture of Constantinople by Mohammed the Conqueror and the cessation of the war; another poem (1456), lamenting his father's death; a homiletic commentary on Ps. xxviii. ; and three sermons preached by Michael in Khania in 1471, 1475, and 1477 respectively. Vatican MS. No. 254 contains an account of a disputation ("wikkuaḥ") between Michael Cohen and Moses Cohen Ashkenazi on metempsychosis ("gilgul") Zunz ("Additamenta," p. 320) is doubtful whether to identify the former with Michael b. Shabbethai or with Michael b. Elijah Cohen, copyist of Vatican MSS. Nos. 345 and 346 (fourth part). Steinschneider doubts the correctness of the name Michael b. Elijah. According to Assemani, the commentary on Averroes' commentary to Aristotle's "Physics" (i.-vi. ), contained in the former manuscript, was made by a pupil of Michael Cohen of Crete. Wolf ("Bibl. Hebr." i., No. 1413), however, ascribes the commentary to Michael Cohen, calling him a disciple of Averroes. Wolf thinks also that the author of the account of the disputation is Michael b. Moses ha-Kohen, who, in collaboration with Abraham Samuel of Sofia, wrote the "Moreh Ẓedeḳ." A work entitled "Sha'are Raḥamim" (Vatican MS. No. 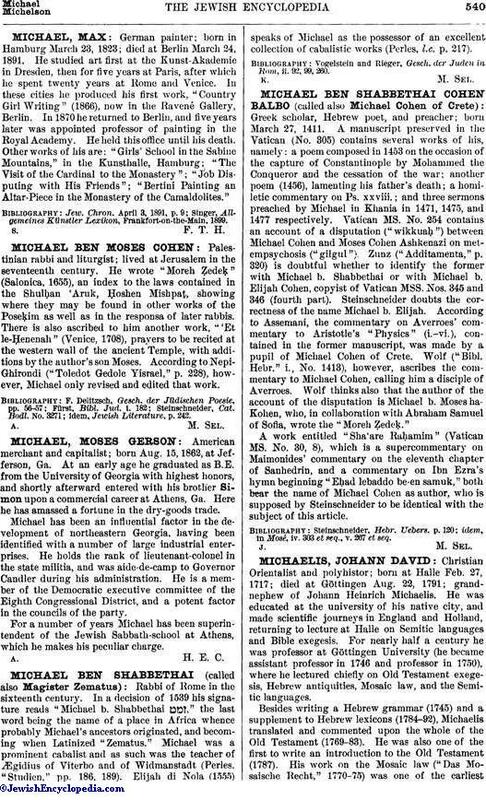 30, 8), which is a supercommentary on Maimonides' commentary on the eleventh chapter of Sanhedrin, and a commentary on Ibn Ezra's hymn beginning "Eḥad lebaddo be-en samuk," both bear the name of Michael Cohen as author, who is supposed by Steinschneider to be identical with the subject of this article. idem, in Mosé, iv. 303 et seq., v. 267 et seq.